On Thursday, October 29, 2015, Barbara Giusti, life-long Citrus Heights resident, was given her wings and welcomed into her eternal home. A true angel, her spirit is carried on by her husband, five children, 17 grandchildren and 12 great-grandchildren. 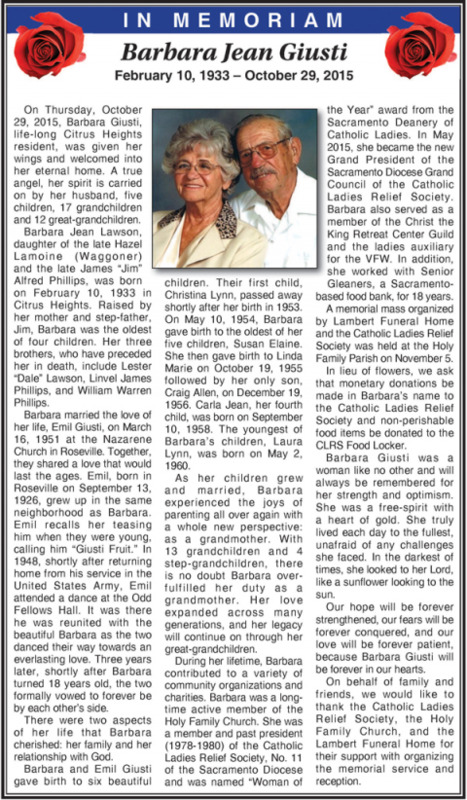 Barbara Jean Lawson, daughter of the late Hazel Lamoine (Waggoner) and the late James “Jim” Alfred Phillips, was born on February 10, 1933 in Citrus Heights. Raised by her mother and step-father, Jim, Barbara was the oldest of four children. Her three brothers, who have preceded her in death, include Lester “Dale” Lawson, Linvel James Phillips, and William Warren Phillips. Barbara married the love of her life, Emil Giusti, on March 16, 1951 at the Nazarene Church in Roseville. Together, they shared a love that would last the ages. Emil, born in Roseville on September 13, 1926, grew up in the same neighborhood as Barbara. Emil recalls her teasing him when they were young, calling him “Giusti Fruit.” In 1948, shortly after returning home from his service in the United States Army, Emil attended a dance at the Odd Fellows Hall. It was there he was reunited with the beautiful Barbara as the two danced their way towards an everlasting love. Three years later, shortly after Barbara turned 18 years old, the two formally vowed to forever be by each other’s side. There were two aspects of her life that Barbara cherished: her family and her relationship with God. Barbara and Emil Giusti gave birth to six beautiful children. Their first child, Christina Lynn, passed away shortly after her birth in 1953. On May 10, 1954, Barbara gave birth to the oldest of her five children, Susan Elaine. She then gave birth to Linda Marie on October 19, 1955 followed by her only son, Craig Allen, on December 19, 1956. Carla Jean, her fourth child, was born on September 10, 1958. The youngest of Barbara’s children, Laura Lynn, was born on May 2, 1960. As her children grew and married, Barbara experienced the joys of parenting all over again with a whole new perspective: as a grandmother. With 13 grandchildren and 4 step-grandchildren, there is no doubt Barbara over-fulfilled her duty as a grandmother. Her love expanded across many generations, and her legacy will continue on through her great-grandchildren. During her lifetime, Barbara contributed to a variety of community organizations and charities. Barbara was a long-time active member of the Holy Family Church. She was a member and past president (1978-1980) of the Catholic Ladies Relief Society, No. 11 of the Sacramento Diocese and was named “Woman of the Year” award from the Sacramento Deanery of Catholic Ladies. In May 2015, she became the new Grand President of the Sacramento Diocese Grand Council of the Catholic Ladies Relief Society. Barbara also served as a member of the Christ the King Retreat Center Guild and the ladies auxiliary for the VFW. In addition, she worked with Senior Gleaners, a Sacramento-based food bank, for 18 years. A memorial mass organized by Lambert Funeral Home and the Catholic Ladies Relief Society was held at the Holy Family Parish on November 5. In lieu of flowers, we ask that monetary donations be made in Barbara’s name to the Catholic Ladies Relief Society and non-perishable food items be donated to the CLRS Food Locker. Barbara Giusti was a woman like no other and will always be remembered for her strength and optimism. She was a free-spirit with a heart of gold. She truly lived each day to the fullest, unafraid of any challenges she faced. In the darkest of times, she looked to her Lord, like a sunflower looking to the sun. Our hope will be forever strengthened, our fears will be forever conquered, and our love will be forever patient, because Barbara Giusti will be forever in our hearts. On behalf of family and friends, we would like to thank the Catholic Ladies Relief Society, the Holy Family Church, and the Lambert Funeral Home for their support with organizing the memorial service and reception.